Located in the heart of Shimokitazawa, one very trendy and very friendly neighborhood of Tokyo, this lovely restaurant/record shop is a bit difficult to find (as all good things are…) because it is on the 4th floor of its building and you have to be careful not to miss the sign on the street. The shop opened in 2006, it sells only used records and CDs (but 90% vinyls) and has a catalog of about 2000 references. They have a website for the shop and one for on-line sales (www.cccrecords.com), but the site is only in Japanese. Mr. Hirata, the shop manager, travels himself 3 to 4 times a year to the US (mainly to the Chicago area) to buy some records. He is not really specialized but he handles a lot of disco, cosmic and world music production. 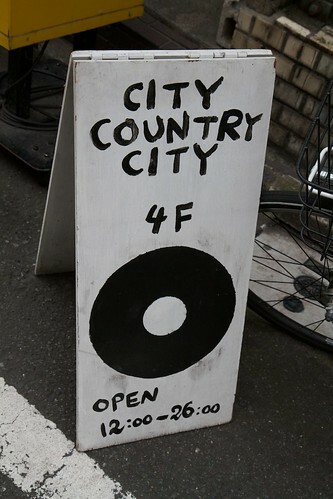 Quite many DJs come to City Country City, as proven by the wall next to the small DJ booth, covered with various signatures. They have on a regular basis live sessions in the store.